The Winter issue of Bay Soundings is out! 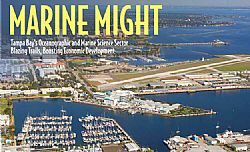 Marine Might: Dubbed the Ocean Team, a cluster of agencies, businesses and organizations in and around St. Petersburg has grown to be the largest marine research complex in the Southeast. Out of Sight Out of Mind: Underground petroleum storage tanks are among the latest targets for cost-cutting in Tallahassee. White pelicans - they're here! Go to baysoundings.com to read all about it!